Transformed from a 15th-century castle, this enchanting hotel has a noble past and beautiful features including a central courtyard and grand restaurant. Swim in the pool set in pretty gardens. Transport yourself back in history when you stay at the Parador Zafra which dates from 1437 and was once the home of the Dukes of Feria. The majestic lounge with open fireplace and impressive corridors are lined with ancient portraits which all tell a story of the Zafras history. The spectacular façade of the Parador Zafra displays 9 towers linked by robust, stone walls topped with turrets. 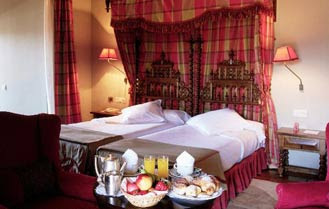 Interiors are beautifully maintained with wrought-iron detailing, high ceilings and furnishings fit for a palace. Enjoy an exquisite meal in the elegant restaurant before relaxing with a night cap in the charming bar. The Zafra is located in the centre of the village so take a stroll through the delightful historic centre and visit the shops, authentic bars and typical restaurants. Não desgostei do edificio mas já merecia umas obras de renovação. Dificuldade em estacionar.